Rebranding is a hot topic in marketing at the moment. Be it a minor change to the Starbucks logo or Malaysian Airlines considering a name change after the MH370 and MH17 disasters in 2014, rebrands provide an opportunity to develop a new identity in the minds of consumers. In the face of adversity or opportunity, marketing managers will often approach an agency with a brief, such as to increase sales over a specified period, and offer a budget. In response, the agency pitches back to the client a solution that potentially recommends a rebrand. Whilst there’s no perfect formula for rebranding, this article provides a hypothetical worked example of an approach for British pie manufacturer, Pukka Pies. Brief: Increase Pukka Pies retail penetration from 5-15% over three years. It is crucial to understand what the brand currently represents in the eyes of both the company itself and consumers, in order to align any differences. Based upon an analysis of products and company communications, two key umbrella terms help to summarise the company perception of Pukka Pies; ‘care’ and ‘quality’. This is demonstrated through carefully sourced ingredients, avoiding hydrogenated fats and preservatives, a commitment to affordable prices for customers, job security for employees and donations to a host of charities. 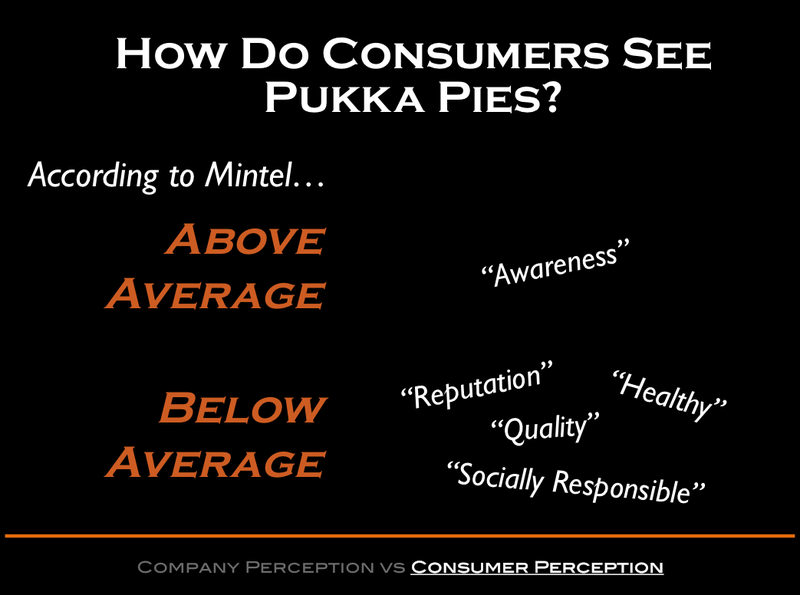 However, according to a recent market research by Mintel, whilst stronger than average brand awareness indicates Pukka Pies has a distinctive image, the data suggests consumer perceptions negatively contradict the ‘care’ and ‘quality’ brand values – with below average scores for ‘reputation’, ‘quality’, ‘healthiness’ and ‘social responsibility’. This analysis suggests many consumers are misunderstanding the Pukka Pies brand. Therefore, the problem does not lie in the strategic direction of the brand, but how it is currently portrayed to consumers. The first step in closing this gap in perceptions is by identifying a target audience for a Pukka Pies marketing campaign. 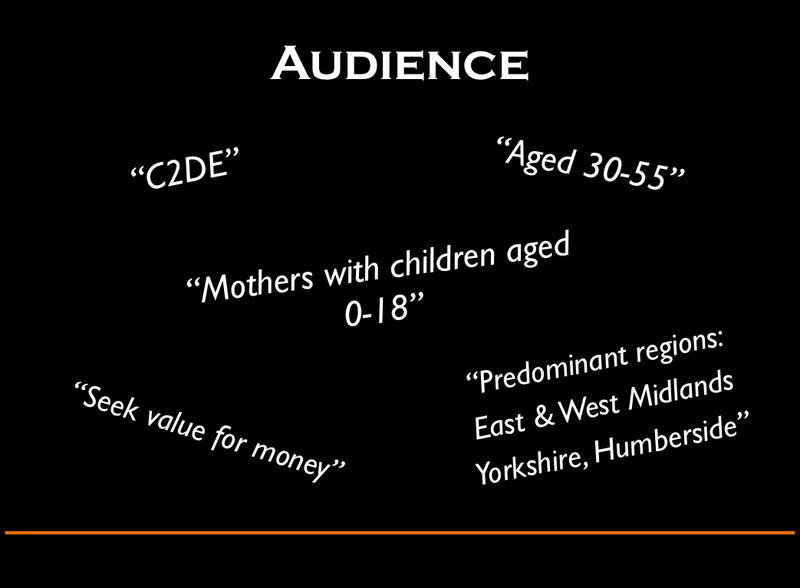 The selected audience must be profitable through ensuring it meets the ‘SMART’ criteria (Specific, Measurable, Achievable and Realistic) and, crucially, they must be able to relate to the brand values. With clear brand values and an audience ready to be targeted, the third task is to identify a consumer ‘insight’; that being a point of contact where the brand and audience can relate. In the case of Pukka Pies, research suggests the target audience of mothers are leading ever-busier lives and therefore have less time to prepare a meal in the evening. Whilst this drives the convenience food industry as a whole, where Pukka Pies can differentiate itself is when combining the growing trait of seeking value for money without willing to compromise on quality – aligning perfectly with Pukka Pies brand values of ‘care’ and ‘quality’. To bring the campaign to life, the insight should be conceptualised into a creative theme that drives all marketing activity. 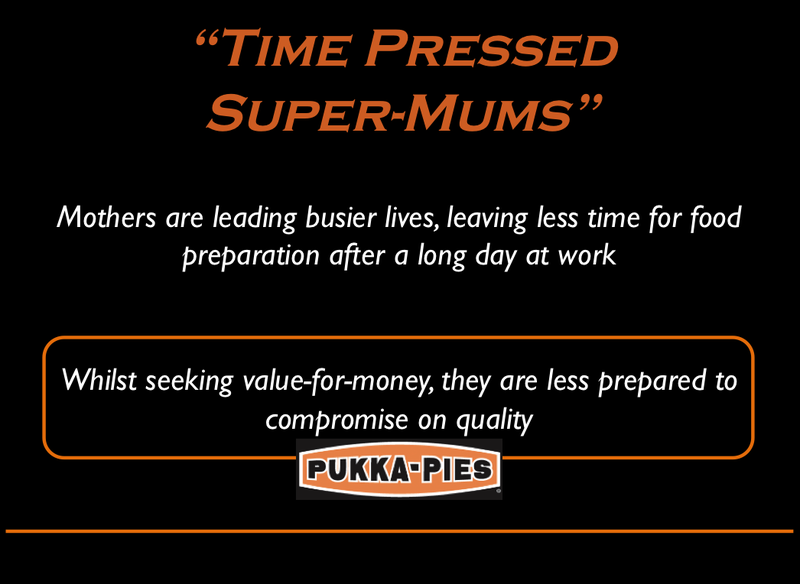 Pukka Pies knows that mothers only wants the best for their children and the brand represents these core values when dealing with its customers. Therefore, the tag line “We care because you care” brings a lot of emotion to the brand and shows that Pukka Pies sees its customers (mothers) as a mother sees her children. Finally, in developing the campaign itself, it is useful to split communications into distinct stages based upon specific objectives. For example, the initial challenge for Pukka Pies is to address negative perceptions of low quality products and being socially irresponsible etc. Secondly, once consumers are willing to trial Pukka Pies, the product should be showcased through trials to support its claim of high quality. Subsequently, the remainder of the campaign is tasked with reinforcing the new brand image in order to drive sales. 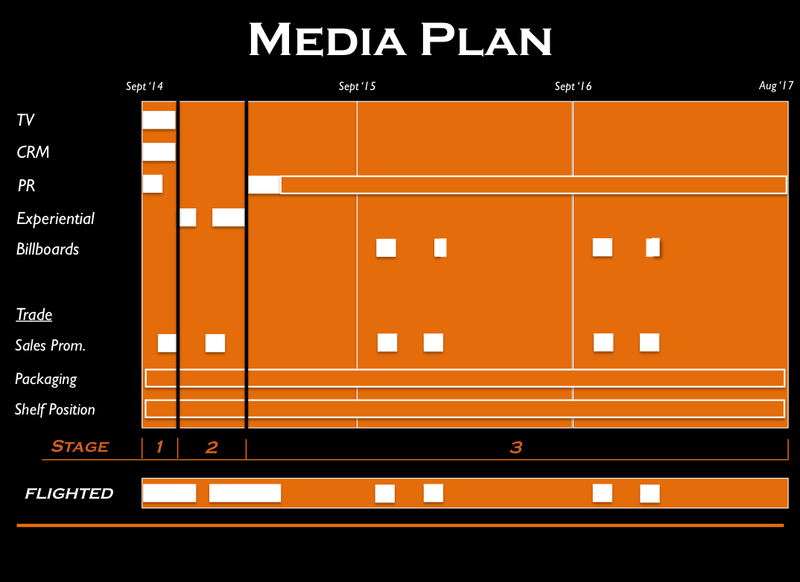 Within each campaign stage, different forms of media are employed to achieve the desired objectives, which then culminate in a final media plan. 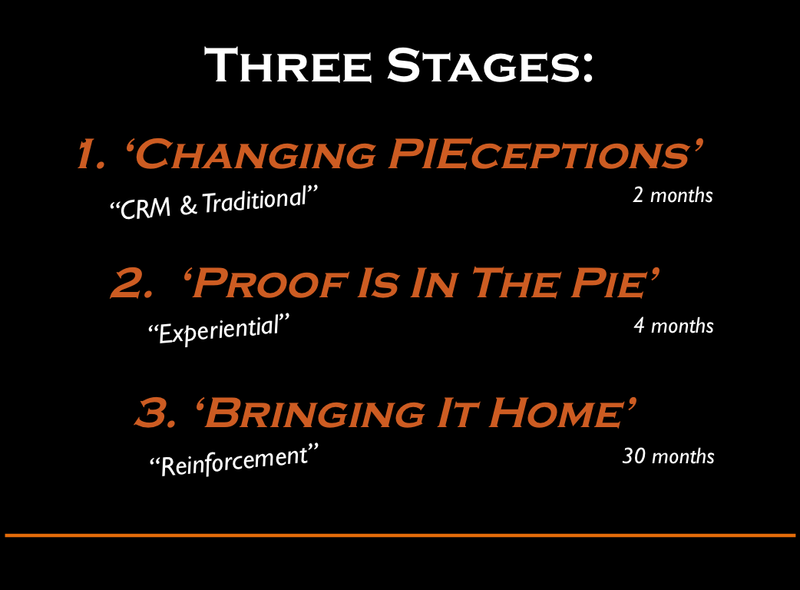 In what’s termed a ‘flighted strategy’, Pukka Pies is required to invest more heavily in stages one and two of the campaign to change existing perceptions through mainstream media and experiential taste tests, respectively. As for reinforcing the brand message in the more drawn-out third stage, infrequent outdoor advertising and in-store sales promotions require less expenditure. This entry was posted in Branding and tagged Advertising, Agency, Campaign, Communications, Marketing, Media Plan, Pukka Pies, Rebrand. Bookmark the permalink.